I stepped out to look at the tulip bed we created last year in the back corner of the yard. Though it is still January, they are poking up out of the ground, from one to three inches high at this point. They were wonderful last spring, and I am happily anticipating a repeat glory of color. I thought of my visit the year before to one of my daughters, who had planted bulbs. She and her husband had bought a house that had been vacant for a while, and the yard had become neglected. There were a number of other urgent items, inside, to take care of when they moved in, and those had required their attention first. Then came the fenced back yard where the kids could go play. Finally, that year in the fall, it was time to look at what the front yard needed. There was a section on each side of the front doorstep where a short brick retaining wall had been raised and filled to create a natural planting bed. The border wasn’t a rectangle, but a ripple edge. She chose tulip bulbs and planted them as a single line along the front, following the contours of those scallops, and she looked forward to spring, hoping that all of them would come up. There were also clusters of daffodils and crocus behind them. She was quite pleased that everything came up. Not only did she have flowers to brighten what had been a slightly barren area, they were blooming right in time for a baby shower she was hosting in a few days. The purple line of tulips formed the visual boundary just as planned. Her next door neighbor had chickens. There was a tall fence, and a separately fenced chicken run within it; the chickens were supposed to be kept strictly within their inside section where they couldn’t get out, because there was a hole in the front corner of the outer fence. 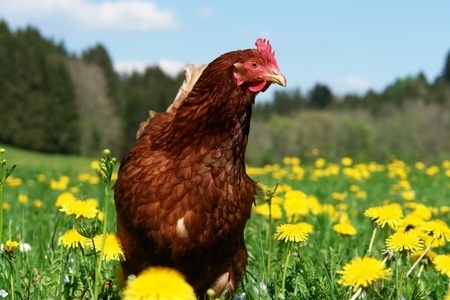 However, the chickens sometimes got out, and she had already talked to her neighbor about it, because one of the birds had damaged some of her flower bed. Well, I went out the side door just in time to see an escaped chicken bobbing the last couple of feet to the front edge of the flower bed. I was not close enough to do or stop anything, and I watched (as I lunged in that direction) while the bird jerked its head forward and back, its beak neatly hitting the base of the tulip and thus decapitating it. Then it stepped, with its bobbing gait, to the next tulip in line to do it again. Which it did. And headed for a third. By that time I had reached it, and shooed it loudly away. I looked and saw that I had not witnessed the first of its assaults. There was a line of upright, empty stems on the other side of the front steps, while tulip heads lay on the ground beside them. Only a couple of forlorn purple tulips still remained to stand sentry. I have no idea what instinct was operating in the chicken. The flowers were at face height to it, shaped perhaps like a head on top of a spindly neck. Did it think that they were rivals? Whatever its purpose or instinct, the chicken had no interest in the tulips once they were no longer intact. It didn’t want to peck at them on the ground, play with them, or eat them. There was no apparent reason for its attack, at least none that you could understand if you were not a chicken. But if you were a human being who had delighted in watching these flowers bloom after a long winter, and moreover the flowers were arriving just at the right time to show them off a little to company coming, you saw a reward for all your digging and watering. It was a pretty upsetting blow to lose them like this. The baby shower went fine, even without the tulips, and life didn’t come to an end—but it was disappointing none the less. We all have those times when we’ve invested thought, energy, effort, and hope into a project which then doesn’t go as planned. Trouble happens. Sometimes the trouble is a marauding chicken, and sometimes it’s something else. Statistically, I’m sure it’s most often not a chicken. Sometimes we work, pray, and hope for a desired result, and all our effort is undone at the end. Much of the time, it’s just stuff that happens, that isn’t in anyone’s control. As human beings we want to place blame, but there is no blame. Weather cancels your flight and leaves you stranded, or your kids get sick, or you do. It’s just part and parcel of mortal life. You want something, you long for it, and life doesn’t cooperate. Sometimes your troubles do come as a result of other people’s choices; the conflicts may be inadvertent and the person messing up the works may be unaware. It could be that that they are aware, but don’t care. It’s hard when harm comes deliberately, from selfishness or ill will. I hope that those situations are few and far between, and I hope I’m not the cause of such trouble for anyone else, that I’m mindful. I will remember the tulips. Though the flowers were lost for the occasion, with no good reason, still the bulbs were undamaged, and the soil was still good. There were much worse things that could have happened. There was no blight, and the plants were still healthy. The following year they came up again and bloomed unmolested, providing the beauty that was intended. They should continue to bloom, and even multiply in the ground —such being the nature of bulbs— for many springs to come. The chicken brought only a passing loss. Our setbacks need not be catastrophic or permanent. If we are stayed upon the arm of our loving Father in Heaven, and of our Redeemer, we can find the serenity and patience to get through our disappointments and our troubles, whatever they may be. I know that sometimes they are huge, and involve a great deal of pain; I have experienced trouble and grief that has only resolved and healed over long periods of time. We can do as Alma taught his people, to mourn with those that mourn and comfort those that stand in need of comfort. That is our calling as members of Christ’s kingdom. Trouble is softened when it is shared. I hope that we can learn to say, truly, with Paul in 2 Corinthians 4:8-9, that “we are troubled on every side, yet not distressed; we are perplexed, but not in despair: persecuted, but not forsaken; cast down, but not destroyed.” I testify that he carries the burdens with us, and we need not be troubled, even as the world around us is increasingly racked with trouble. If we know the love of heaven, we know we are never alone. Jesus knows our troubles, for he has already felt them all. I began my first column with the musical prayer, “Tune my heart to sing thy grace.” I will end with the last line of that hymn: “Praise the mount, I’m fixed upon it, mount of thy redeeming love.”* That love will never fail, no matter what may arise.